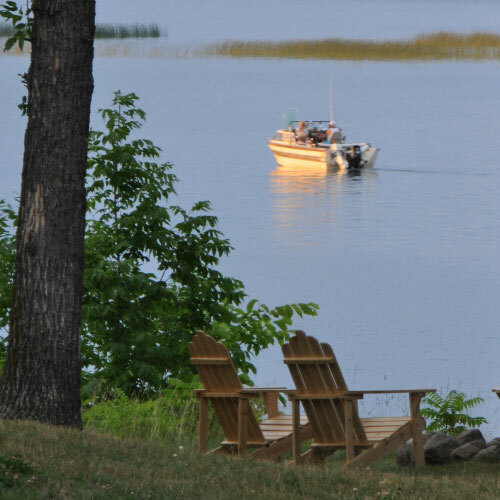 This summer take a no hassle vacation on Leech Lake. 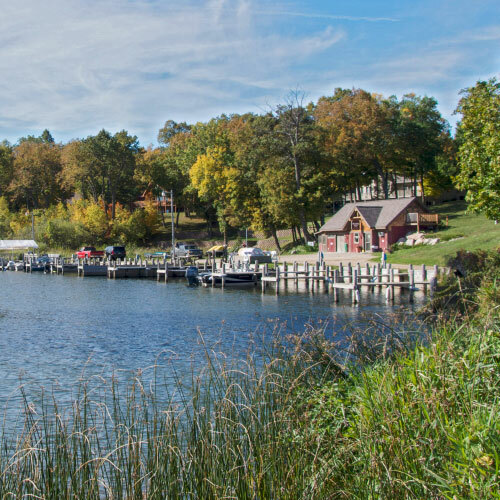 Trapper’s Landing Lodge Marina has everything you need to enjoy summer on the lake! Your family and friends will enjoy hours on the water whether reeling in a record walleye or relaxing on a pontoon. Before you hit the water stop at the Trapper’s Landing Lodge Trading Post (located at the marina) for everything from snacks and sunscreen to rods, reels, tackle and bait. Take some time to chat with our friendly staff for information on the latest hot spots. These guys really know their stuff and are fishing the lake regularly. Trapper’s Landing Lodge has canoes and kayaks available for guests to use at no charge. 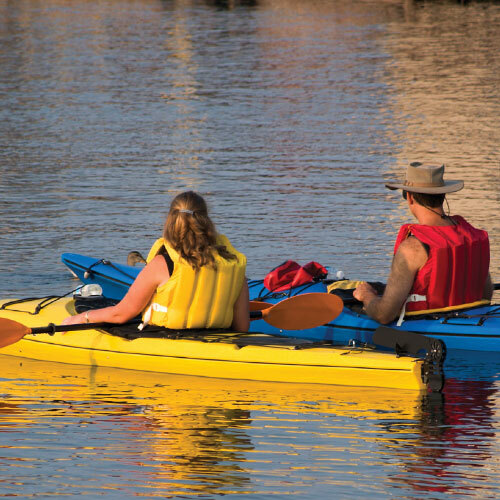 Check-out a man-powered craft for up to two hours and explore the lake – you’ll be able to get a close-up look at wildlife, easy access to the lake’s many islands and a great workout to boot! A peaceful canoe or kayak trip is a great way to watch the sun rise or set over Leech Lake. Visit the marina to reserve your canoe or kayak. Leech Lake was created in 1882 when the Leech Lake Dam was built, raising the water level enough to connect 6 different lakes. This history and the shear expanse of the lake lend to its many points, narrows and islands. Directly in front of Trapper’s Landing Lodge is Pipe Island, a small piece of land that makes for the perfect landmark when trying to find your way back to the resort after a long day of fishing. You may want to check out these other popular Leech Lake landmarks. Say you’re standing on your patio at Trapper’s Landing Lodge, looking out over endless Leech Lake. Now, about three miles out, on the right side, is land that looks like the same lake shoreline that connects around to Trappers. But it doesn’t. It’s a long strip of land, about 140 acres, called Bear Island, and it is indeed an island. When you head over there with your boat, you’ll be able to motor around it. You’ll notice there are homes on the island, but no bridges to the mainland. There is no running water or electricity on the island. Bear Island has significant American Indian heritage and because of its location in a warmer lake-effected micro-climate, contains unusual plants. No timber harvesting is allowed. The northern tip of Bear Island points right at the Leech Lake shoreline called Battle Point. In 1898 the 3rd U.S. infantry was attempting to apprehend an Ojibwe chieftain named Bugonaygeshig, who violated the law by conducting a bootlegging operation, but American troops were successfully fought off at this point by Bear Island Pillager Indians. This last scuffle, called the Battle of Sugar Point, was the location of the last Indian uprising in the United States – the last time the United States Army fought Native Americans. Six U.S. soldiers were killed; ten were wounded. Only one Indian was slightly wounded, and ole chief Buggy was never captured. About two miles dead west of Bear Island, smack in the middle of Leech and due north from Trappers is a 100 yard stretch of land called Pelican Island. As you learned in a previous post, Pelican island is where most of Leech’s cormorants nest. Pelican is a protected nature reserve and nesting ground for thousands and thousands of birds, including pelicans, sea gulls and the cormorants. It is surrounded by large rocks, so you won’t be able to get your boat within a hundred yards. Humans are not allowed on Pelican Island: just birds. If you pull out of Trapper’s Landing Lodge and keep the shore on your left side, the first point you’ll come around is Rogers Point. Shortly after you’ll pass Horseshoe Bay Resort, round Stony Point, and then officially be in Traders Bay. If you head to the dead center of the bay, you’ll find what is known as the Agency Narrows, which is your passageway into Agency Bay; and your quickest way to get to Walker Bay. Agency Bay, right around the narrows, is a popular boat hangout spot, as the lake bottom there is sugar-soft sand and the water is shallow for almost a hundred yards out. In summer months many boats will be anchored here all day long, and folks will be grilling burgers on board, or set up a camp along the shore. To get to Walker, after crossing southeast through Agency Bay, (about two miles across) bear right, and use the city water tower in the distance to guide you to the dock at city park. If you’re trying to find Walker by water at night, as of this last year, there is a lighthouse in city park to guide you. The lighthouse, about 30 feet tall, was donated to the city of Walker by private residents and built last year on site at the park. It is available to rent for private functions. Call the Chamber of Commerce for inquiries, (218) 547-1313.